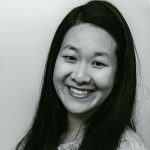 Published Jun 28, 2017 By Julia 52 CommentsThis post may contain affiliate links. 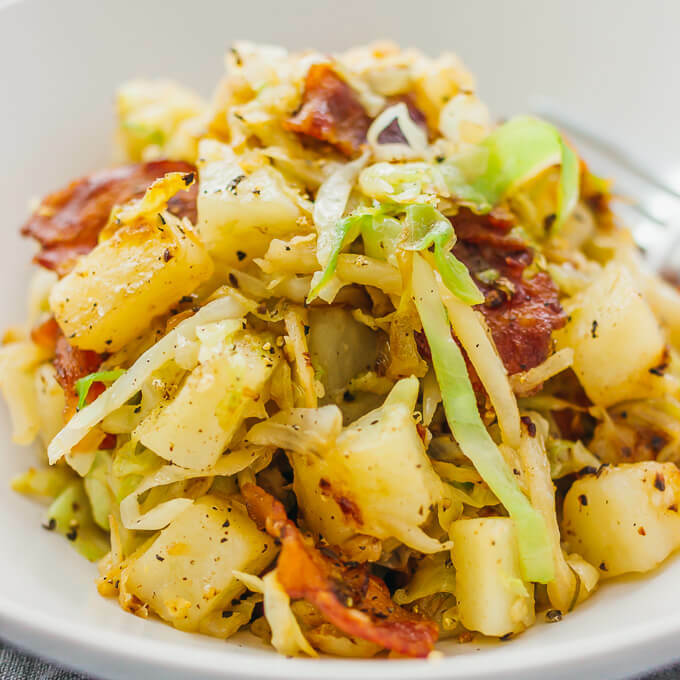 This is a really easy fried cabbage and potatoes recipe with crispy bacon. Only six ingredients and one pan needed. 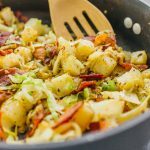 This fried cabbage and potatoes dish is a really quick skillet dinner for two that’s ideal for those busy weeknights. 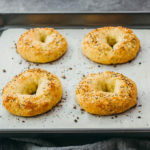 There are only six total ingredients — and that includes salt and pepper — and you only need one pan and thirty minutes of your time. 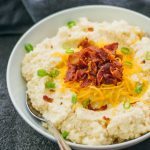 I love all of these ingredients; the inclusion of potatoes turns this into a really comforting dinner, and the crispy bacon adds a crunch to every bite. I consider this to be a dinner dish, but it can also be served as a hearty side dish. 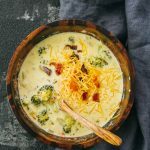 This dish came about when I was looking for a year-round substitute for one of my favorite cold weather dishes: brussels sprouts with bacon and cranberries. It’s very similar, with cabbage replacing the brussels sprouts, since they are often not readily available throughout the year. 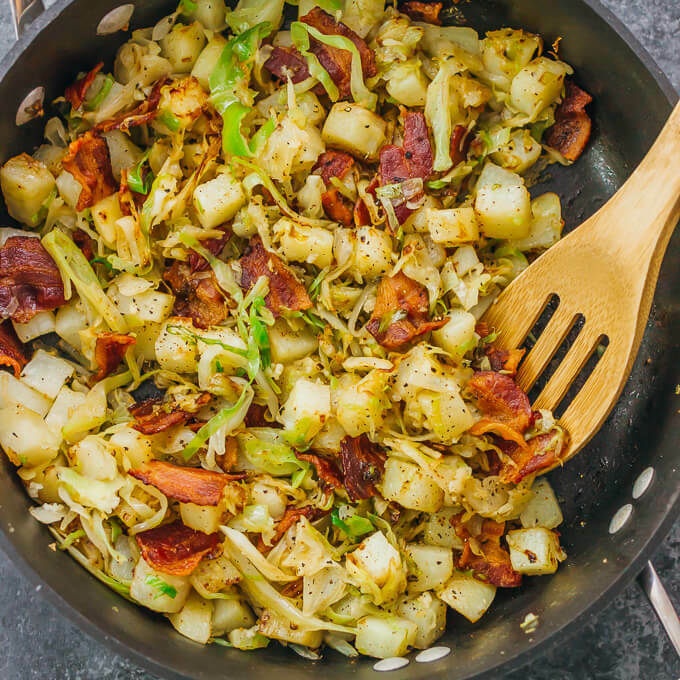 If you’re a big potato fan like me, you might even like this fried cabbage and potato dish better than its brussels sprouts counterpart. 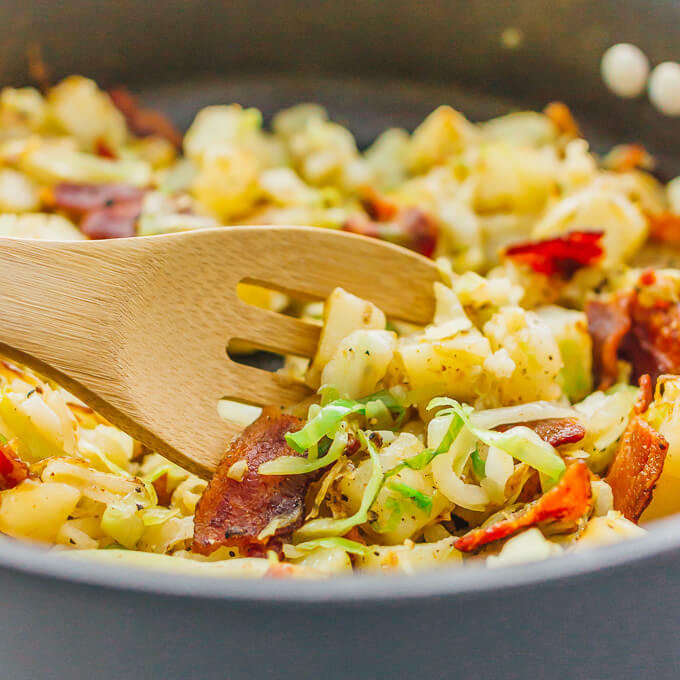 This is one of my favorite ways of cooking cabbage, which is a great vegetable because it’s high in fiber and low in calories. To turn this into a healthier dish, you can substitute green cabbage for a mix of green and purple cabbage. Purple and reddish varieties of cabbage have ten times more vitamin A than green cabbage, and contains antioxidants that are good for your cardiovascular health. 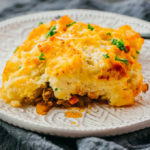 All of these dishes can be made in just one pan and are really fast recipes to make. Cook bacon on a large nonstick pan over medium heat until crispy, about 10 minutes, flipping occasionally. Transfer bacon to a paper towel to drain. When cool, crumble into 1/2 to 1 inch pieces. We really liked this, although I made some changes. I went to 12 ounces of cabbage, cut the bacon to 4 slices and did 2 cloves of garlic, but added 1/2 of a medium yellow onion. I parboiled the diced potatoes for about 4 minutes, just to make sure they were done. This would be so great with a poached egg on top! This was delicious! I parboiled the potatoes, and was incredibly happy with the results. 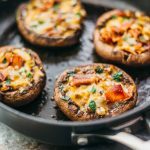 Served alongside eggs and toast, it’s a great breakfast for dinner! This was so tasty!!! I added an onion to mine and a pinch of chili flakes for a little heat!!! Will definitely make it again soon!! Delicious!! This is the second time I’ve made this in two weeks. This time I added more potatoes. Just finished having this for dinner…amazing! I added kielbasa, red onion, jalapeno powder, granny Smith apple, apple cider vinegar, brown sugar. I used unpeeled red potato cubed, garlic powder since I was too lazy to peel and chop garlic. 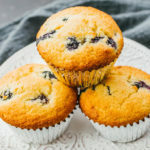 I mixed two recipes together. Sounds delicious! I’m glad you were able to modify it to your liking. Did you add vinegar in the end? How much and what does it add taste wise? THANK YOU! Sounds so good, think I will add two potatoes and double the bacon and serve with grilled chicken breast and call it dinner! Very tasty! I agree with the previous comment. I added meat from a smoked turkey leg and bacon too. It really turned out very flavourful. I laughed as I read your reason for making this dish. Please understand in knowing that I too, was trying to find a use for my left over cabbage after making my Mother’s beef vegetable soup. This cabbage potato dish is cooking now and smells divine. Can’t wait to dig in. 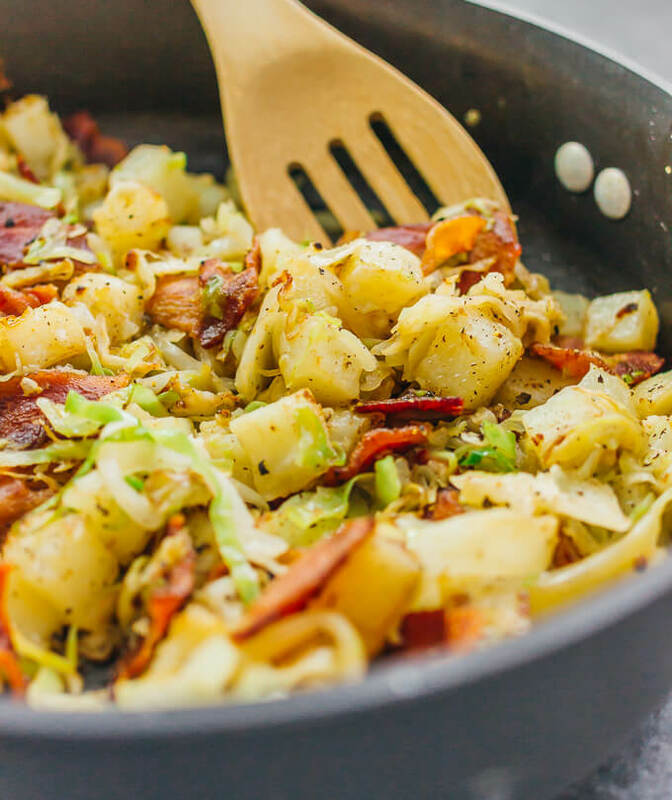 I am in the process of making cabbage potatoes & bacon. Will bet you know how it comes out. Great flavor..will definitely be making again. 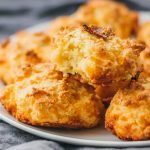 Great recipe made mine a little different used sea salt, didn’t slice up cabbage too small. Made it for a family of 3. Also used real bacon pieces instead of sliced bacon. Still turned out well. Thank you.